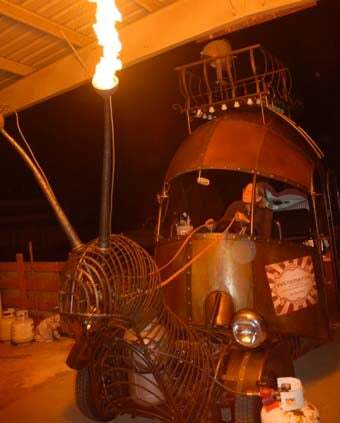 Fun With Fireballs, Handmade Hooch, And Art Cars In West Oakland Tonight! Want to check out the Golden Mean, a fire-belching Volkswagen Beetle-based giant snail that seats six and packs an 800-watt sound system inside its shell? With snake charming to boot? Head to Oakland tonight! The Boiler Bar is having a May Day celebration at their Magnolia Street HQ, starting at 8:00 PM tonight. It's unclear how many art cars will show up, but the Marriage Wrecker and Neverwas LB&O Trolley should be there in addition to the Golden Mean, and there will also be "Snake Charming, CanCan Girls, Belly, Glass, Fire & May Pole Dancing, Burlesques, Balancing Acts, and Old Timey Music." I'll be there, trying to recruit art car builders for the 24 Hours Of LeMons. Give that snail a roll cage and some more horsepower and it could totally compete on the track!